Pro Tools | Adding mass to your kick drum can improve the sound. Adding mass to your kick drum can improve the sound. It may sound like a daft idea but I was watching a DVD featurning english drummer and personal hero of mine Simon Phillips. He was explaining how adding mass to a drum can improve the tone. The process is simple. 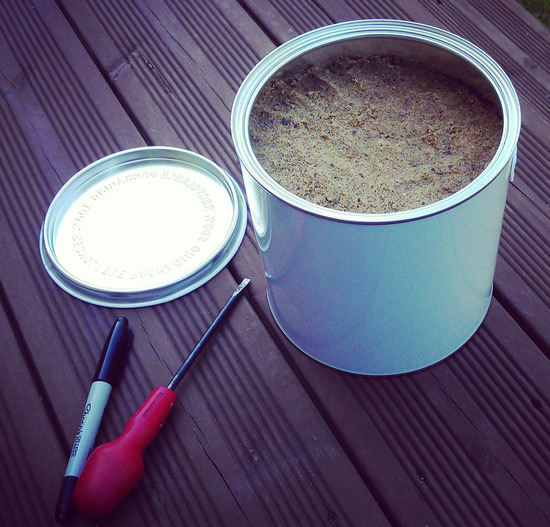 Take an empty 2.5L paint tin. You can use an old used one but I found this one on eBay for about £4.00. Fill it with sand (dry “play” sand is best) and place it in the middle of the kick drum on a towel or the like. Replace the outer head and play as normal. There are probably as many different ideas and tricks to creating a good drum sound as there are rock drummers in LA but try it. If you like the diffence it makes and so far I do, all the credit goes to Simon Phillips.